I no longer let him wear my FS Band because I am getting much more sleep with it these days. I rarely have to take medications to help me fall asleep and I feel much more rested in the morning. We love the Beam resonant frequency products! 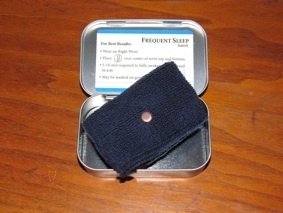 I have had the great pleasure of using your Sleep Bands since August 2009, when I first tried a prototype. It is an amazing product. Prior to using the Sleep Band I was awakening about every 2-3 hours throughout the night, and never feeling like I had had a full or deep night’s sleep. My first night using the Sleep Band was the last night of a business trip in Las Vegas and I only had about 2-1/2 hours available between going to bed and waking up for my flight connection. But by using the band not only did I fall asleep quickly, upon awakening I felt as if I’d had 8 hours sleep, not just 2-1/2 – really well rested. 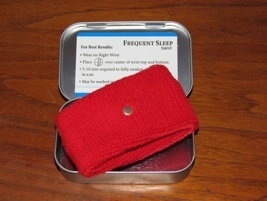 When I got on the plane to take me cross-country for my next destination, I put the Sleep Band back on, and an eyemask and ear plugs, and slept the entire duration of the flight, a solid 3 hours from 7-10am, again feeling refreshed and energized upon awakening. I’ve never gotten off of a plane feeling so good. Since then, I’ve used it nightly. I sleep fully, and have the pleasure of restorative dreams again. 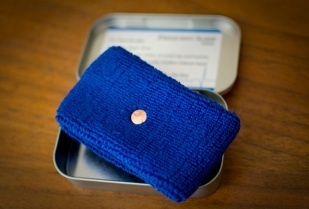 When the finished product became available, I bought one, and gave my prototype to my teenage son. He and my tween daughter used it alternately to the point where they were competing over who would get it – so I had to buy more so they each had their own. They both use theirs nightly. I have also given them as gifts to others, as a good night’s sleep is the most important step towards good health that we all can take. Occasionally, life has presented so much stress that one band isn’t quite enough, so I then use the prototype as well on the opposing ankle, and I’m back to perfect sleep. This allows my body the immediate benefit of necessary regenerative sleep while I work with my herbal and nutritional supplements to correct the deficiency that the extra stress has created in my body. 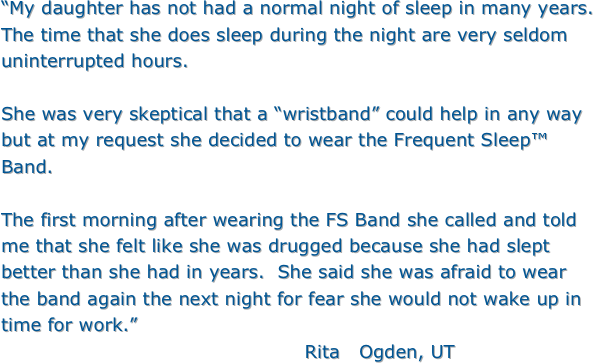 As a nutritional educator and consultant here in New York City, I have suggested to many clients that they use your Sleep Bands as well. They are happily using them. Occasionally, someone will report that they feeling a tingling/electric sensation when they put the band on, or sometime thereafter. What we have determined within my group is that when this happens, the band is indicating that the person is deficient in minerals and/or nervines. So we support the body with more fluids, then more minerals, and if necessary, more nervines, depending upon our determination of the need, and when these levels are sufficient, not only does the sensation cease, but the person achieves the improved sleep as well. So we feel the band is also an indicator for the body’s need for additional nutritional support, in an immediate, non-toxic, non-invasive way. What a fabulous tool! Finally, given the economic stresses that so many people are experiencing these days, there isn’t a better investment that I can think of than your Sleep Bands. Buy one and you’re done. They don’t have to be plugged in or replaced in any way, since the charge in the chip is permanent. The price is not just reasonable, it’s affordable. All other sleep-aids are consumable and so must be repurchased. 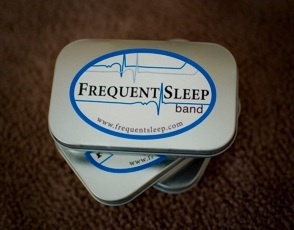 Not so the Sleep Band. You’ll only have to buy the next one to replace yours when you give it to someone else who needs it more than you. Thank you for making this wonderful technology so available to so many. You are doing the Lord’s work! You were certainly right about dreams with the use of the sleep band. My husband and I are having wonderful dreams and great sleep. Thank you for your commitment to produce such a terrific product. Additionally, my 85 yr. old Mom believes the necklace is helping her neck with some occasional discomfort she has in the cervical area (due to some degenerative disc tissue). their best…to help His children!! !